I need to do something! And then I started hearing about other friends with kids the same age as M, or older kids who are the same size as M (as she is as tall, if not taller than her boy friends who are 4), putting their kids in booster seats (some without backs) too. Should I be looking at a booster seat for M? Is she ready for one? Has she outgrown her current Britax (Boulevard) carseat? Is it safe to put someone so young in just the standard car seatbelt? I told her about the photo I saw of my friend's son and she said told me that, "most state laws require children to be in a forward facing car seat/five-point harness system until at least the age of four. It's also what's recommended by the AAP. Four is the earliest I'd recommend moving to a booster seat; but only if the child has outgrown the car seat." Teresa explained to me that I should be keeping my girls in a 5-point belt car seat for as long as I possibly can as it has proven to be the utmost safest way for your child to travel in the car. She confirmed the fact that M has actually outgrown her current car seat, as the top of her head has well passed the top of the car seat. I was under the impression (from the Britax Boulevard manual) that she could still be in this car seat until the top of her ears were at the top of the back of the car seat, but I was mistaken. Since M is still not yet 4 years of age, I immediately purchased her a Diono Radian RXT (just like her sister has) as the Radian RXT can be used forward facing, with the 5 point strap until she is 80 pounds (which at this point might be when she is 20). Also, the Radian can be used as a booster, with the car's seatbelt up to 110 pounds! I was curious as to what car seat my Facebook friends/followers currently have their children in, and when I reached out to them I was utterly shocked by how many people still have their kids in a 5-point harness at the age of 6. One of my friends questioned why she would make her child "less safe" by putting them in a booster when she can keep her in a 5-point harness. And I asked myself that same question. The answer of course is, I wouldn't. 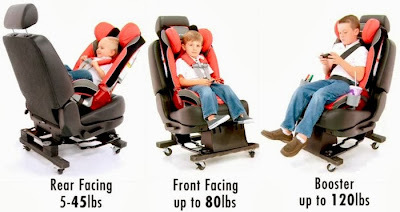 So the lesson we learn today is this: Purchase a 5-point harness car seat that has a very high weight and height limit and keep your children in a 5-point safety strap car seat as long as you possibly can (no earlier than 4 years of age, says our expert). Teresa holds a MS in Child Development from Wheelock College and an MPH in Maternal and Child Health from Boston University School of Public Health. She is certified by the American Heart Association as a CPR and First Aid instructor. Teresa is a member of the Safe Kids Boston Coalition and MassPinn (Massachusetts Prevents Injuries Now Network). She combines those areas of expertise to help parents understand why our children do the mysterious things they do and how to keep them healthy and safe. Teresa also supports parents around sleep through her work as an Isis Sleep Consultant. Teresa is the mother of a daughter and toddler son and understands the joys and challenges of parenting. Aw - Teresa was my Great Beginnings teacher. Memories. We were at a 4 y.o. birthday party recently and the Mom was saying how she couldn't wait to put the birthday girl in a booster. I didn't say it, but I was thinking "why the rush?" Her daughter is tall, so maybe she's having the same issue you're having with M, but I think it was more the convenience factor. For me, a) why would I go out and buy 4 new seats (twins x 2 cars) if we can use the ones we have and b) umm, why wouldn't I keep the girls as safe as possible?? We'll have to replace our 2 Britax seats at some point (probably very soon based on your info!) because they won't be tall enough, but I plan to use our 2 Radians for quite some time still!